J Quenton Ashlyn’s humorous song The Bassoon, with its mildly outrageous lyrics and bassoon-fuelled innuendos, has understandably been very popular amongst bassoonists for many years. However, virtually nothing is known about the composer. He was a singer and songwriter (presumably based in London) working in the music halls in the late nineteenth and early twentieth centuries – several of his songs were issued by various publishers, including Just at that Critical Moment, The Ladies, Marriage à la Mandoline and Very Embarrasing, Very!. One of the songs, published between about 1895 and 1900, shows a photograph of him aged about thirty-five to forty years old, but beyond this there appears to be virtually no information about Ashlyn. The internet reveals nothing useful, the British Library has the published songs but no details, the PRS/MCPS copyright database contains no useful information, an in-depth search of the Stationer’s Hall entries at the Public Records Office in London produced nothing (he is not even listed in the 1901 census, which suggests that the name is a pseudonym), and searches of music publishers’ archives revealed nothing beyond the fact that his name began with ‘J’. An appeal for information from anyone who knew Ashlyn or knew of him, sent to every relevant national and regional newspaper in Britain, produced nothing. We do not even know his birth and death dates. All we know about the song is that it was originally published by Reynolds (a popular and prolific London-based song publisher in the late nineteenth century), and first appeared in about 1900. We can be confident in assuming that he did not play the bassoon, as the song does not offer a bassoon part – the bassoon ‘cue’ in the printed music is simply ‘pom, pom, pom’ in the lyrics! Why he wrote it, or who played the bassoon with him when he performed this song, is not known. 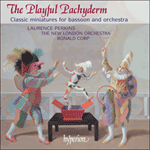 Nevertheless, it is a hugely entertaining ditty that establishes beyond doubt the role of the bassoon as the leading instrument in the orchestra, a valuable asset when wooing your lover and a vital accessory around the home! What more could one ask for?